First Governor's School, now Teaching Fellows. If I didn't know better, I might worry I'm the jinx that's causing these nationally-recognized education programs to land on the state's fiscal chopping block. But it's not me. It's the North Carolina legislature and a penny-wise-pound-foolish approach to crafting the budget. In addition to plans to cut funding for teacher assistants, virtual school programs and pre-k programs (among others), there's now a Senate proposal to eliminate Teaching Fellows. The North Carolina Teaching Fellows Program, established by the General Assembly in 1986, is billed as "the most ambitious teacher recruitment program in the nation." The idea was to recruit talented high school students and provide them with additional supports (both financial and experiential) as education majors so that they would be better prepared for teaching and thus more likely to stay (and be successful) in North Carolina classrooms. Currently, the program pays an annual scholarship of $6,500 for four years, bringing in 500 future teachers at 17 North Carolina campuses each year. Students who choose not to teach in NC public schools after graduation repay the funds as a student loan. The program has been copied by other states and a recent study of teacher effectiveness found Teaching Fellow graduates are among the most effective teachers in the state. When I attended UNC Chapel Hill as a Teaching Fellow from 1991-1995, the program essentially paid for my four years of college plus small stipends for summer programs in exchange for four years of teaching in Charlotte after graduation. In addition to the scholarship funds, the program offered four years of special seminars in education, hands-on internships in area schools, targeted summer learning opportunities across the state (and the globe), plus a cohort of bright classmates who became like family during college and my years as a teacher. It was a big decision as a 12th-grade student to commit to a university, a major and a job before I even had my high school diploma in hand -- but in many ways, that single decision charted the path of my entire career. There are some who might argue that I'm a perfect example of how the program has failed. I completed my degree in education, taught for four years (which "paid back" the scholarship), then left for graduate school and never returned to classroom teaching. But I believe just the opposite -- being a North Carolina Teaching Fellow got me into the classroom for four unforgettable years. Without that scholarship, I might never have gone into teaching. And the program's influence on me -- and hopefully my influence on public education in this state -- didn't end when I left the classroom. Since my career as a high school English teacher, I've continued to work in public education for more than a decade -- first at the county level and now at the state level in professional advocacy, research and communications roles. I've worked with teachers, principals, parents and business leaders in their efforts to ensure that all students have access to a sound, basic education (as required by the state constitution) as well as exciting innovations taking our state's schools far beyond "basic." I talk to friends, neighbors, anyone who will listen about the critical importance of a strong system of public schools for our community. I stay informed and vote based on education issues and their impact on our state. I still think of myself as a Teacher. I am a better teacher, better parent, better citizen for having been a North Carolina Teaching Fellow. I just hope our legislators don't destroy in one budget cycle what this state has spent 25 dedicated years building. Click here (starting on p. 4) and here (starting on p. 2) to read more from Teaching Fellows who are speaking out against the eleventh-hour Senate budget proposal to cut all funding for this powerful program. Is That a Leak in My Ceiling or Just My Own Tears? you'd think I'd be done with water leaking through my ceiling. But, sadly, you'd be wrong. Yes, that's a gash in my upstairs ceiling with water dripping through it. And yes, that strange curve is the bulge of the wet drywall sagging with the weight of it all. And yes, it's nearly three feet long. This time, it wasn't the shower (photo 1) or toilet (photo 2) leaking into the kitchen. Today it was the A/C in the attic -- someone dumbass DIY previous homeowner repaired a broken PVC pipe with duct tape and even though we had a maintenance check on the whole system last year, apparently no one bothered to properly install the run-off pipes for the water overflow from the A/C unit. So it's been leaking into the attic floor for who knows how long and finally burst through the ceiling this morning. Thank goodness for awesome neighbors/contractors who responded to my panicked phone call, converged on the house within minutes and repaired the leak within an hour. At least now the A/C is working, although the hole is the ceiling is another matter. If I call my husband one more time at the office to tell him that it's raining inside our house, I'm pretty sure he won't come home anymore. The world didn't end over the weekend. Thankfully, as I'd hate to be raptured with all this unfolded laundry sitting around. But on Friday, before we survived the "prophesy," my dear friend wrote a note and posted it to her Facebook page. She's one of the kindest, most beautiful people I know -- and she has a way of talking about God and faith that makes me want to be a better person. As you might already know, I've wrestled a lot with my religion, my church, my faith. I still don't have any answers -- and I get uncomfortable sometimes about the "Christian" label and all its baggage. So for now, I'll share with you her beautiful words -- when you read it, I suspect you'll wish she were your friend, too. I’m trying to wrap my brain around my feelings about the hub-bub around the idea that the rapture will occur tomorrow (5/21). Admittedly, I’m kind of a news snob and tend to get my news from NPR, which hasn’t been giving the whole thing a lot of airtime. I am also (admittedly) a Facebook junkie and all of the sudden, I’m seeing this whole notion all over my newsfeed. And it makes me sad. Sad, not because people are making jokes about the second coming of Jesus. Rather, I’m sad because of what our culture thinks of Christians. Hear me loud & clear, I’m NOT blaming the culture. I’m blaming the Christians, of which I am one. Let me clarify again... I’m not blaming individual Christians, or ALL Christians, but I can’t help but look at this little circus around “May 21st” and feel like something is horribly amiss. I find myself wanting to apologize to people who are not Christians. I want to apologize for the ways that Christianity has let our culture down. I want to apologize that the idea of Jesus coming again gets translated into billboards and condemning speeches, instead of an opportunity to show people God’s love. I want to apologize that so many people who are “Christians” have done such a poor job of following Jesus’ two most important directives: to love God with everything they are and to love other people. I find myself wondering if tomorrow really WAS to be the rapture, why aren’t people running around trying to love each other like crazy? (And since Jesus says He doesn’t actually even know when then end of the world will be (Matt 24:36), I just don’t buy that some preacher-man has the inside scoop). Shouldn’t we, as followers of Christ, be loving people *every day* with an intensity as though tomorrow was the end? Shouldn’t we be loving people with everything we’ve got every day, like it is our opportunity to show how much we (and God) love them? Isn’t loving people the very root of what Jesus came to do and called us to follow Him into? I know some really wonderful Christians who show the love of Christ to the people around them. I know people who take the call to follow Jesus with a sincerity of heart that brings me to tears. I’ve experienced the love of a community of Christ-followers in the darkest days of my life. I believe with everything that I am that there are pockets where people are living out love in every way God intends for it to work. I also know that there are so many people out there for whom the word “Christian” brings an instant sense of nausea. And I concede that, for many reasons, that reaction can be so well deserved. I also freely acknowledge that I used to be a person who rolled their eyes and was disgusted when I heard that someone was a Christian. Because here’s what I thought that would mean: I felt it would mean that person thought they were better than me, that they would judge me for my behavior, that they would not approve of who I was, that they were closed-minded, elitist, and conservative, that they were a hypocrite, and frankly, that they were no.fun.at.all. Never in my assessment did I think that this person was in my world to show me, in practical, tangible ways, that God loved me. Maybe you are reading this and you are thinking, “yep, that is what I think about Christians.” Maybe you have other icky qualities you’d like to add to the list. And, in so many cases, you’d be absolutely right. What I’d like to think is that you are reading this and thinking, “Wait a minute, I have Christian friends/family, and nobody in the world loves me better than them!” How I pray that is the case. And that is why I’m sad about this end-of-the-world business. Because I’m seeing anew that Christians, as a whole, have done a pretty poor job of representing the main point of Jesus, that point being LOVE. I don’t sit here pretending, at all, that I represent Jesus well, every day, all the time. I don’t always love you like I wish I did. I don’t always make loving choices. I don’t always engage with other people’s needs. But what I can tell you, is that because of the way that I’ve encountered the love of Jesus and people who love Him, I am a different person than I used to be. And that change drives me to WANT to be more loving to the people in my world, whether they follow Jesus or not. It is because I’ve received great love that I’m learning to share great love. And so, friends, I just want to say I’m sorry. I’m sorry for the ways that the whole of Christianity has failed and I am sorry for the ways that I, personally, have failed in love. But I do hope you will continue to give me the opportunity to show you what I believe Jesus is really all about--a deep, deep love for YOU. Parenting makes you say crazy things. Not just the things you swore you'd never say -- like I haven't yet said "Stop it or your face will freeze like that," but I do regularly tell my kids "Because I said so, that's why!" Beyond those good 'ol classics, there are also those other, much more hilarious comments -- things that make sense in the context of the moment, but sound completely ridiculous after they've left your mouth. You know, like "Jesus is not a drumstick" and other gems my kids have actually heard from me. So, for your Friday entertainment, here's another round of Who Knows What the Hell I Meant When I Said These Winners..
Stop that -- you can't blow bubbles with a bagel. My face is not a handle. Quit licking the carrots, please. Don't put your tutu in the ketchup. No, we cannot be naked on the neighbor's deck. Due to some unknown Blogger difficulty, this post got deleted yesterday. Grrr. Reposting, for your summertime reading/viewing pleasure. Even though it's cool and rainy today, I know it's coming. Thank goodness. How do I know is on its way? 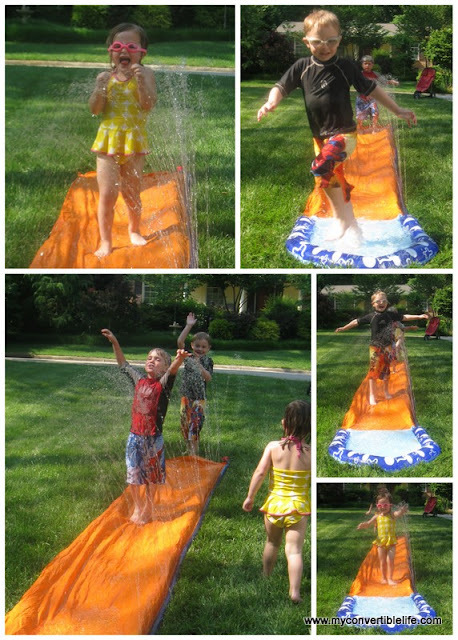 Tuesday marked the inaugural slip-n-slide play date in our yard. The hose water was cold, but the sun was shining and the kids were flying. Makes you wish you were a kid again, doesn't it? How about you? What sign do you see that summer is on its way? My friend Momsicle posted some amazing brunch recipes on her blog this week, then invited some other "foodies" on Twitter to join in. Given that I couldn't resist the notion of being called a "foodie," I decided I must have something to contribute. But given that I'm not actually that fancy in the kitchen, I'm stealing sharing a friend's recipe. Technically it's her husband's recipe, which I had the good fortune to sample at their daughter's third-birthday party. Because that's the classy kind of friends that Pippi hangs out with. Sorry there's no photo -- I was too busy eating that day to take pictures. In case anyone is looking for something tasty to make for mom on Sunday (for brunch, second breakfast or elevensies), here's a great option. Chef's disclaimer: Jay does not measure, so all measurements are approximate. Feel free to use more or less of whatever, or add your own ingredients in place of ham, pepper and onion as you like. In a large oven-safe pan, sautee butter with onion, pepper, and ham. Add salt and pepper to season. In a mixing bowl, combine eggs, milk, and more salt and pepper to season. Once ham/onion/peppers are golden/translucent/tender, pour egg mixture into sautee pan. As the eggs begin to cook, move the mixture in the pan so that the eggs cook evenly (chef says "lift the eggs on the side of the pan so that the other eggs get underneath"). Once the eggs are almost done, sprinkle with cheese and pop under the broiler until the cheese is melted. Slide onto a platter and serve -- feeds 6-8 people, depending on how hungry you are. I got these stitches over the weekend in Pakistan. Would tell you more, but without appropriate security clearance I'd have to kill you. Okay, okay. It was actually pint glass to the head during a pub brawl after Wills & Kate got married. You should see the other guy. All right, fine. I got attacked by the dermatologist. Skin surgeon, to be exact. My second time having Mohs (rhymes with "nose") surgery on my forehead. Don't really recommend it, but it's better than letting a basal cell carcinoma turn into some other more frightening form of cancer. I blame Garden City Beach, SC, summer of 1987. Me in my first teen-age bikini -- floral, with ruffles (it was the 80s, after all, and I needed the help). He was tall and thin with a great smile. We spent a couple hours talking and flirting in the ocean, no sunscreen to protect my face from the bright sunshine and the even brighter reflection off the water. When I woke up the next day with a headache, I looked in the mirror to find my purple, blistered forehead had swollen to twice its normal size. The bad news: my parents wouldn't let me out of the beach house during peak sun hours. The good news: the boy still thought I was cute enough to send me a mix tape (Guns N' Roses, Metallica and U2, 'cause he was that cool) when he got back home. Now, more than two decades later, I'm paying the price. So in case you needed a reminder to wear sunscreen and hats this summer, take another look at those stitches. I can promise you the boys do not think they're a turn-on. Thankfully, my husband loves me, even when I'm wounded. Today was a perfect day in Raleigh for a baseball game -- sunny skies, but not too hot. A lovely Sunday afternoon for sitting outside, lounging in a stadium seat and eating a hot dog. This beautifully plump face is what you get when you take a toddler who only got eight hours of sleep last night and no nap today with a belly full of hot dogs and Skittles, some warm sunshine and a good snuggle in her mama's lap. Even the cheering Wolfpack fans couldn't wake her after she crashed just before the seventh-inning stretch. On a related note, if you're looking for a fun family outing, I highly recommend an NC State baseball game. For those few faithful readers out there, you may remember our disaster at the Mudcats game. Thankfully, the Wolfpack games have been just perfect for us -- close to home, reasonable crowds, quick concessions, friendly staff and a great stadium. We may be back again next weekend -- let's just hope Pippi can stay awake long enough to sing "Take Me Out to the Ballgame." Note: I'm not trying to overtake Naps Happen and her fabulous blog -- and this was no top-of-the-stairs nap today -- but it was just too cute not to capture.